Graduation for May 2010 Clemson graduates is this Friday, May 7th - with the usual two ceremonies held at Littlejohn Coliseum at 9:30 a.m. and 2:30 p.m.
For graduates this is an emotional time - excitement for the end of classes, studying and finals; anxiety and nerves about what the future holds; and bittersweet feelings of leaving Clemson and the memories, friends behind. 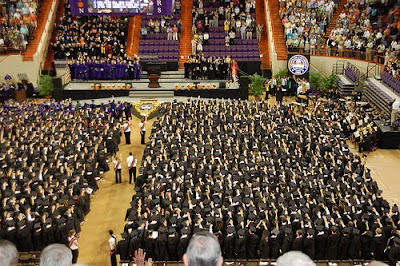 Read this great article from Clemson University's Web site that features five May 2010 graduates who reflect on their education and experience at Clemson and their future after graduation. And as Clemson sends a fresh crop of experienced and well-educated professionals out into the real world, it will also be taking in a new freshman class. This time of year also marks the graduation of hundreds of high school seniors who have been accepted to Clemson and will soon be joining the Clemson family. One of the blogs I follow, The Sweat Sea, is authored by a 20-something college student up in Boston. She is graduating this May and posted a great excerpt from a Spring 2005 Boston Globe article that I'd like to share for all of you incoming, new Clemson Girls. Although, while this excerpt is filled with great advice for incoming college girls, it also has great advice for all of us - young and old. "Start the day with breakfast. End it with dessert. Exercise every day (see 'dessert,' above). Make it a part of your life. Smile while you're running or biking or swimming. It will lighten the task and disconcert others. Beware of the 'Freshman 15.' It's a lot easier to keep weight off in the first place than to take it off later. When walking, don't look down. All you'll see is dirty shoes. Look around, look up; observe the world. People-watching is a fantastic pastime. Listen well - to your friends, to the birds, to music. Wear comfortable shoes. They don't have to be ugly. Don't worry if you don't know what you want to be when you grow up. May of us adults still don't. Write thank you notes. Why shouldn't you take five minutes to say thanks when someone has taken much more than that to buy, wrap, and send a gift? (And if you don't write thank you notes, you won't get as many gifts). Find a soul mate. The most important decision you'll make in life is whom you choose to spend it with. Get a dog. They're walking lessons in love and loyalty. Spend time with children and the elderly. They're master teachers. Go out on dates. Have a relationship. Don't settle for 'friends with benefits.' What is the long-term 'benefit,' anyway? Vote. It's proof that you're a participant, not a spectator, in our democracy. Read the newspaper daily (preferably, this one). Earn your own money. Save some of it. Get a comfortable bathrobe. Guard against smugness, which is simply self-ignorance. E-mail often. Keep in touch with your siblings; they're the ones with whom you will share your old age. Don't take a television to college. If you're doing things right, you won't have the time or inclination to be a couch potato. Find your passion and pursue it. Tell your parents you love them. It won't kill you, and it will thrill them more than you now. Volunteer. Get outside. Study under a tree. Take a break and play volleyball or toss a frisbee. Buy a bike. They're fun and environmentally friendly. Be kind. Tell corny jokes. Don't color coordinate. Dance with abandon. Dare to be dorky. Be curious. Take chances. Go someplace new. Do something different. Laugh often and loudly. Especially at yourself. Never pay full price. Don't worry about geometry. Chances are, you'll never have to use it again. Get acquainted with the washer and dryer. Change your sheets more often than every leap year. Make friends across cultures. Learn another language; go abroad and practice it. Remember that luck is a large part of life, but so are the choices you make. Eat chocolate. Read for pleasure, not just for class. Read everything from Homer to Homer Simpson. Give surprise parties. Don't be afraid to ask for help. Stay in touch with your old friends. They knew you when. Lock your door when you leave your room and when you go to sleep. Always wear a seat belt. Learn to say 'I'm sorry.' Remember to sleep. Remember to go to class. Start 'War and Peace' now. You might finish it by graduation. That tattoo that seems so cool today won't be 10 years from now. Ditto on the nose stud. Be patient with your parents. Someday, God willing, you'll be as old and ignorant as they are. Call your mother. She loves you." So, what advice do you have for incoming Clemson Girls? Or how about advice for this May's 2010 Clemson graduates? Post your advice in the comments. Congrats to all 2010 graduates! STAY AT CLEMSON AS LONG AS YOU CAN!!! I did...5 1/2 years, and wish I would have stayed longer!